I understand the whole Forrest Gump thing about life being like a box of chocolates. But I think life is more like a salad. In a box of chocolates, you're basically only experiencing one specific chocolate at a time. In a salad, there's a whole bunch of ingredients mingling around at once. I mean, sure, you could say that chocolates better capture the element of surprise that life throws at you sometimes, but with salads, just because you know what you're purchasing, you still can't be sure exactly what it will taste like when you put it in your mouth. That notion intensifies when one travels full time. We generally know where we're headed, but we never know what we'll experience when we get there. We were just in 70 degree weather in Nevada a week ago, and now, in April, we find ourselves dipping below freezing again here in Utah, experiencing snow showers, looking at enormous, majestic mountains out our living room windows, and seeing some sights we've wanted to see for a long time. We're not finding luck with traditional RV parks out west like we assumed we would. We're finding it even harder to purchase wine here than it was in Pennsylvania and South Jersey. Imagine that. 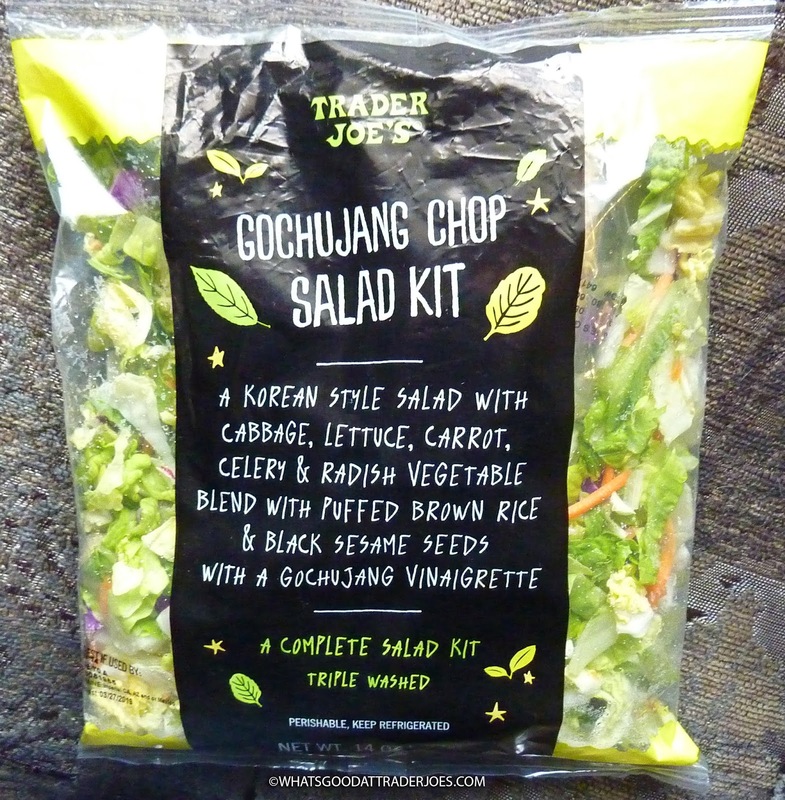 It's a mix-up of wonderful and frustrating experiences, kinda like this new salad kit from TJ's. Sonia thinks the cabbage and lettuce were just shy of fresh here. I'm not sure it's apparent in the photo we took, but I can't disagree. There was just a slightly sad, soggy quality to the lettuce in our bag—something we seldom experience from Trader Joe's. It wasn't inedible. It was just...not the freshest lettuce/cabbage we've ever had. That's likely to vary greatly from bag to bag, region to region, and week to week. It was likely just a stroke of bad luck. And again, the greens weren't terrible. I almost didn't even mention it. But now I did and it already sounds like I'm complaining. So I'll just get the rest of my complaints out of the way and then continue on to more positive stuff. The puffed rice was an odd element to me. It was crunchy, which was nice, I guess. But I just can't shake the notion that it's cereal. I guess if I were forced to pick a cereal to put on a salad, this would be a more logical choice than, say, Count Chocula or Raisin Bran, but I generally wouldn't go putting cereal on my salads in the first place. It needed more dressing. Sonia doesn't even like a ton of dressing usually, but she totally agreed, maybe because she absolutely loved this dressing. I liked it a lot, too. It's got a bit of spice to it. It's...I dunno...very Asian-tasting—like something you might pair with a Chinese chicken salad, except in this case, it's Korean. I must admit, this is my very first Gochujang rodeo. Russ and Sandy took a gander at some Gochujang almonds a while back, but Sonia and I never tried those. Sweet, spicy, and savory red chili paste. That's what I keep reading about it everywhere, and that sounds pretty accurate. 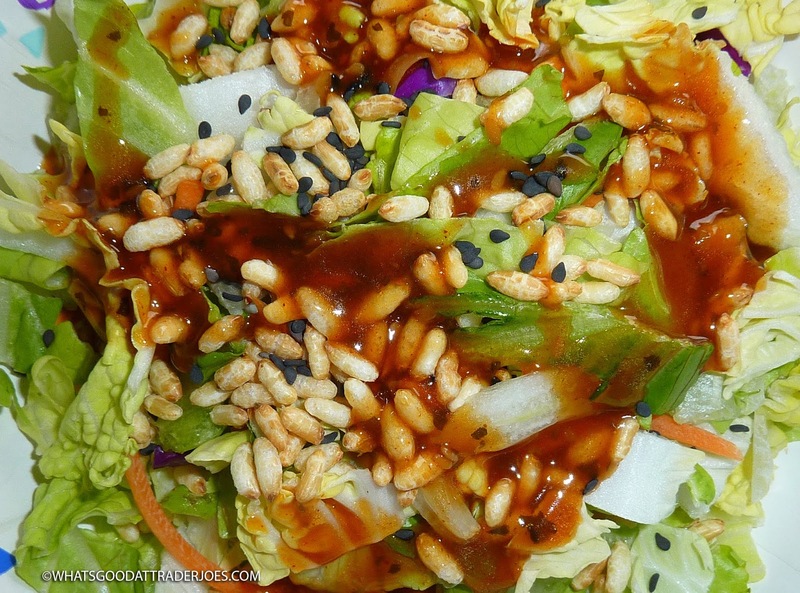 This salad dressing was a "Gochujang vinaigrette." It was by far the best element of the mix in my humble opinion. The black sesame seeds were interesting. They added a distinctive crunch to the mix, and flavor-wise, they lent a slight nuttiness when consumed en masse. They were so tiny, their flavor was nearly undetectable in the bites when only one or two wound up on our forks. Overall, we liked them. $3.99 for the bag. Plenty of salad for two people. Not sure if we'll purchase it again. Three and a half stars from each of us. I'm third generation Korean American.. I will say I have never heard of anything like this.. I can't remember a Korean salad like this... the closest is is a cucumber salad that had soy sauce, sesame seeds, and vinegar which was similar to a korean vinaigrette...Guess TJ is digging deep w/this one.. btw its been passed up in the store, haven't noticed it in anyone's cart. I have poor digestion so I don't eat raw food. I think most Americans do and actually make themselves suffer a lot by attempting to force salads down thinking it healthy (heavy stomach? pain? bloating?). I will actually cook lettuce and the like in a wok instead (which I learned from Grace Young! Check her out!) Due to the addition of gochujang (a sauce I checked Trader Joe's for as soon as I tasted it at a Korean BBQ restaurant, to no avail at the time), I checked this bag out as soon as I saw it, thinking I could use the ingredients in a stir fry. Ultimately, I opted not to. It also didn't look very fresh, and I think that could be because.. no one is buying it, like the other comment says. I used a lot of parenthesis today.